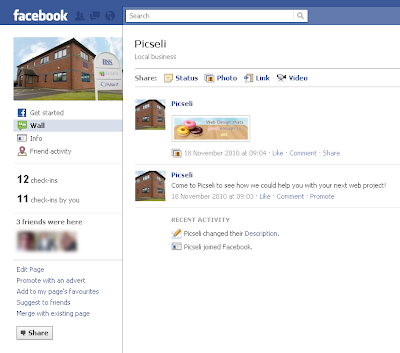 Back in December I blogged about How to Claim your business on Facebook Places and way (way) back in November 2008 I wrote a post explaining How to create a Facebook page for your Company. I have noticed that you now have the option to merge the two pages so you don't need to try to get 2 lots of fans ('likers') or update different statuses. You'll notice that in the left hand column, just about the 'Share' button is a link that says 'Merge with existing page - click it and you will get a pop up box asking you which page you want to merge it with. 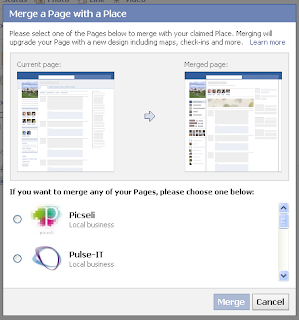 Select the page you want to merge & click the 'Merge' button. You'll then be asked to confirm your choice. And there you have it, your pages will be merged and any 'check ins' will now be visible on your main Facebook page, plus you'll see a 'Friend Activity' link (see box in left hand column below). I have been asked to update some previous posts as Facebook has changed the way they do things a bit, so if there are any How To guides you like to (they don't all have to be Facebook related) please let me know by commenting or send me a tweet. 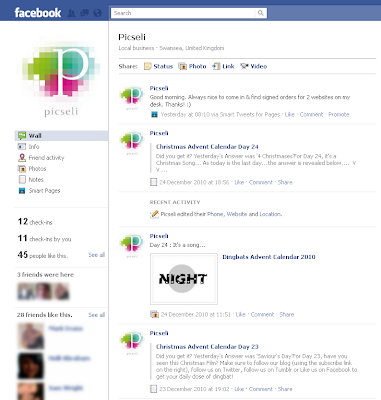 "We have scheduled the Page migration from Page "Picseli" (http://www.facebook.com/pages/Picseli/173696612657206) to Page "Picseli" (http://www.facebook.com/picseli) . It might take up to a week to complete the process. Thank you for your patience." So whether there will be more changes, I don't know! Will keep you posted. Do you know where to get a good middle school persuasive essay topics? I have a few but I wanna get more. Absolutely right, it is very compulsory for each user of Facebook to know this information. I like it and australianwritings reviews also share with my relevant people. I will try to follow your explain points. Nice work with sort of info. An area of the facebook is waiting for your working pattern. You can find the new place or the best zone for your working session. You can go to this website very much easily in order to find the peace and love to your skill. With this page of the facebook you can find the better section in this place. You can find the best links on this page which can be more great for the new session. It's your fun to make the new week of the fun. An area of the facebook page where you can find more places of the pages. You can claim your bussiness on the facebook and can earn more. Just get this nice blog more offical and find more special links. Superb post, Potentially I am misinformed about the correct importance of the benefit yet it is an uncommon thing. This website is so incomprehensible henceforth fantastic for me. Receive dissertation writing help services at Students Assignment Help. Our expert assignment writers have gained their degrees from the most reputed universities of the UK, Australia, and Singapore.